U.S. Special Representative for Ukraine Negotiations Kurt Volker called on the Ukrainian authorities to allow Russian observers to monitor the presidential election in March 2019. "Ukraine needs ODIHR [OSCE Office for Democratic Institutions and Human Rights] monitors to prove it adhers to democratic standards. Otherwise allows people to question election. OK if Russian monitors are part -- but under ODIHR authority. No games. 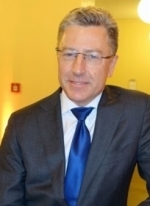 Ukraine needs to have confidence in its own democratic institutions," Volker wrote on Twitter.